TrackingDays is a unique day counting App for the iPhone. (Android coming soon). Many people, need to keep a record of the days and time they spend in different locations. TrackingDays does this automatically, keeping track of your days and nights, wherever you are in the world. TrackingDays takes the hassle out of day and night tracking, giving Expats and Non-Residents one less thing to think about. "TrackingDays significantly reduces the headache of keeping track of your days and does so effortlessly on your iPhone"
Who benefits from using TrackingDays? 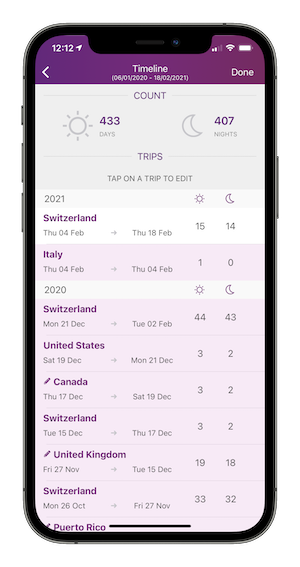 TrackingDays is the perfect tool for individuals ‘counting days’ or ‘nights’ to establish their country of residence. TrackingDays is flexible and is built to work for all countries where day counting is a requirement to help establish Expatriate Tax positions. UK Expats - find it extremely useful for day counting, in-line with the "Statutory Residents Test" (SRT). US Expatriates - use the "Non USA Days” feature to assist counting days for the "Physical Presence Test”. Snowbirds and Non US Citizens can use TrackingDays to count days for the "Substantial Presence Test”. 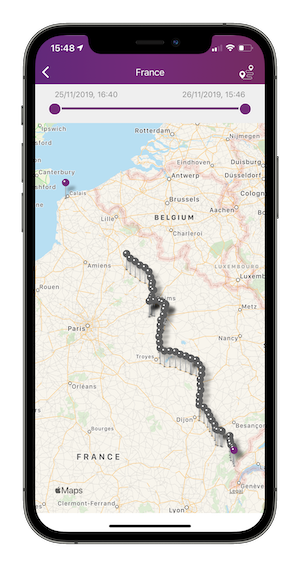 TrackingDays has uses its own unique Geo-location techniques, so it doesn’t require traditional mapping files or data to confirm your location. This means is it can locate your position, worldwide, in real time and without data roaming charges. A mobile data connection, required to download local maps and locate your position. TrackingDays will keep record in real time, even when you don't have a data connection. "TrackingDays just works. It can tell which country I'm in and it keeps track of all my travel, which I can then forward to my accountant at the year-end." TrackingDays runs continuously without the loss of battery life often associated with Apps that rely on GPS. It works efficiently in the background of your iPhone using information generated as you move around, so it uses very little processing power and won’t run your battery down. Just leave it running to track all your days and nights. "I can just leave TrackingDays running and I'll have a detailed record of my UK days at the end of the year." Users can set and adjust date ranges, allowing them to recall their country locations on any given day, week, month or a full tax year. For US expats, tracks 24 hours days, starting at midnight, spent outside of US Territories. Different trips are conveniently split in the ‘Trips’ summary page. Can be adjusted to collect only headline country location. Delete or add days or nights, edit existing entries as required. Tracked location points are stored and pinned, to be viewed when a data or WIFI connection is conveniently available. Your tracked days are stored locally on your phone and backed up to your own iCloud account.